Adding high tunnels to your farm won’t automatically make you more profitable. Before you start investing in structures, you need to push a pencil or play with spreadsheets to ensure that your efforts will result in financial – as well as horticultural – success. You will need to know fixed costs associated with all of your agricultural enterprises including taxes, depreciation on multi-purpose buildings, etc. in order to put together a comprehensive whole farm budget, but also to help project costs over time. You should also have a reasonable idea of what your variable costs might be. Use enterprise budgets to compare the potential profitability of different crops that you might plant in the high tunnel. Then use that information to examine the profitability for a high tunnel in your current farm operation. You can use partial budgets to analyze the impact of small changes on the profitability of your production system. Fixed cost: A cost incurred even if nothing is produced. This would include the cost of constructing and outfitting a tunnel, then depreciating those costs along with the interest on borrowed money and costs associated with property taxes, office expenses, marketing fees and any other fees that are constant. Variable cost: The cost of inputs that are incurred only if you actually produce something. These input costs change depending upon the quantity and price. Variable costs increase as production increases and decrease as production slows. Good examples include seed, fertilizer, fuel, and pesticides. You can change variable costs to alter the production process, but once you have incurred the expense, it becomes a fixed cost associated with that production cycle. Whole farm budget: A projection of the total production, income, and expense for the entire farm business. It’s important to have one if you are approaching a lender. Enterprise budgets estimate the profitability of the enterprise by listing all associated income and expenses. They compare the profitability of various enterprises on the farm and are helpful when preparing whole farm or cash flow budgets. Comparing high tunnel tomato production to field tomato production is a good example. Another comparison would be examining two different crops in a high tunnel to determine which would be the most profitable. This example looks at the potential profitability of a trellised tomato planting in a high tunnel vs. a non-trellised planting. ($5.40 + $1.10) – ( $3.00) = $3.50/plant increase in profitability by trellising the tomatoes. Depreciation is an annual non-cash expense that recognizes the amount an asset loses value due to use, age, and obsolescence. The cost of your tunnels can be depreciated over time. Be mindful of restrictions to depreciating horticultural structures. A horticultural structure is defined as a structure specifically designed, constructed, and used for the commercial production of plants. Some restrictions apply: A structure must be used only for the purpose that qualified it. For example, using part of your greenhouse to sell plants will make the greenhouse non-qualifying property. If a structure includes work space, the work space can be used only for the following activities. Caring for plants or their produce. Maintaining the enclosure or structure. Maintaining or replacing the equipment housed in the structure. Keep in mind that in the first year you are only allowed to take half of the eligible depreciation. Depreciation rules are found in The Farmers Tax Guide, IRS pub. #225 Farmers can choose their cost recovery system but a single purpose horticulture structure can be depreciated across 5, 10 or 15 years. Farmer A’s structure cost $10,000 (including frame, covering, supplies, labor etc.). The balance recovery system best suited for you will depend upon your individual tax situation and the asset being depreciated. Consult IRS Section 179, “The Special Depreciation allowance” (or ask your tax specialist). The amount of depreciation is claimed on Schedule F of your income as an expense. Marketable yields from high tunnels tend to be higher than in field production due to improved quality and less loss from animals, weather and pests. In some cases, high-tunnel harvests may command price premiums because they reach the market when similar field-grown crops aren’t on the market. Choose your crops wisely. Some crops, despite their increased quality, may not capture enough of a price increase to warrant being grown in a tunnel. Farmers need to maximize returns of products from high tunnels and often choose to direct market their crops. There are many highly profitable avenues for direct marketers, but the proximity of markets and availability of labor may determine which market options make the most sense. Retail farm stand – If you have a location with good traffic and have the labor to make it work, a farm stand may be your best option, despite the higher initial investment. Using a high tunnel to increase the number of crops offered at the beginning and end of the season or improving the quality of desirable crops can help develop customer interest and loyalty for the rest of the season. Farmers market (including winter markets) – A small monetary investment is required, especially compared to a farm stand. Very competitive environment fosters innovation on the part of the growers. Each farmer needs do something a little bit different to successfully compete for customers. Winter markets take full advantage of the modified environment of a high tunnel. U-pick – Success can be location-dependent, but this is an option for crops with intense labor demands at harvest, such as tree fruit and berries. Be careful of local regulations involving sales area in a greenhouse. Community Supported Agriculture (CSA) – A high tunnel may offer CSA farms an opportunity to mitigate risk associated with crop failure. Despite the fact that customers agree to share the risk associated with farming, providing a reasonable harvest every season will help guarantee return customers. Terminal markets – Creative wholesale opportunities exist even at terminal markets. If you have a high quality product and can guarantee supply, buyers will be interested. Produce auctions – Auctions are becoming more popular and seem to fill a niche in certain communities. Again, high quality and consistent supply are the keys to success. Direct sale to restaurants – Historically classified as a wholesale market, but growers who have cultivated upscale restaurants or specialty stores as clients demand retail prices for high quality and unusual produce. These crops often demand the unique growing environment of high tunnels, and extended harvest season is a plus for chefs wanting to increase their use of locally grown food. This website has several tools that can help you organize your current expenses and plan for future endeavors. See the sample budgets and spreadsheets page. This whole-farm recordkeeping tool you’ll find there will help you develop a whole-farm budget and then accurately develop enterprise budgets. 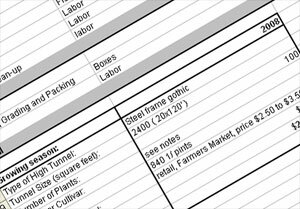 Once you have a handle on existing income and expense items involved with high tunnel production, you can take a look at these partial budgets to help you make crop choices. Please remember that these budgets are drawn from existing farms and are examples of what you could expect if all of your inputs and markets were the same. They are provided to give you an idea of the items you should be tracking and how pricing might impact profitability.